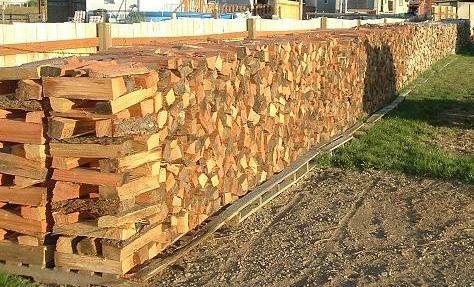 An experiment to discover whether tradional Holz Hausen or Holz Haufen woodpiles are superior, equivalent or inferior to normal stacked rows of firewood; whether different parts of a Holz Hausen season faster than other parts eg higher or lower in the Holz, outside horizontal stacked wood ring vs interior upright or vertically stacked wood; how much benefit in seasoning the sun provides; and whether east-west or north-south stacked rows are superior. 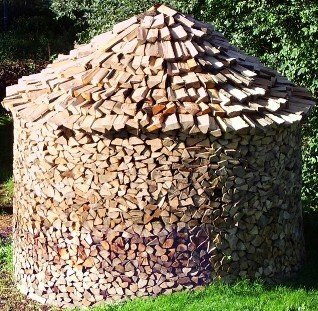 Having accumulated enough wood for a Holz Hausen and having been keen to build one ever since I discovered them a couple of months ago, I plan on commencing my splitting and holz hausen stacking early spring (in the next few weeks - check my location if this doesn’t make sense) and I was planning on measuring and determining some differences between a HH and a regular stack. 1) Build an approx 8’ diameter and height HH. Clear and level a spot with good northern exposure (sunny) and decent airflow. 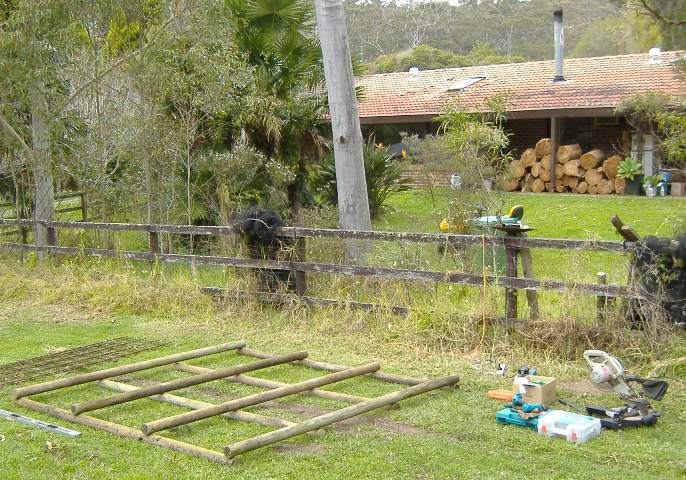 Put some treated pine timber down to raise the HH off ground a little (prevent it becoming a snake house). I might get a bit engineery with the platform/base so it will last for years if the HH proves a success and I keep building them. 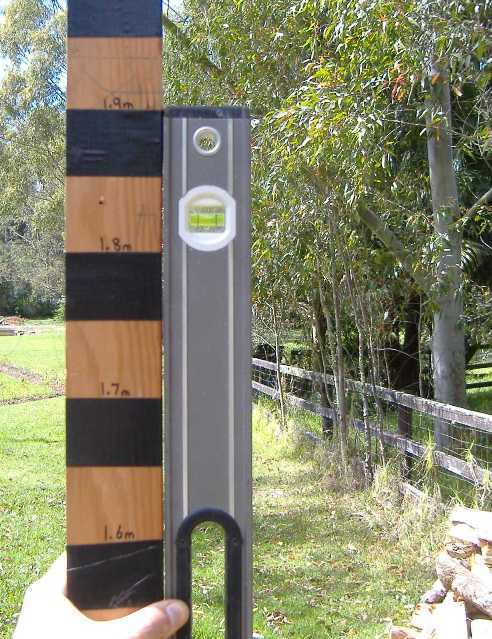 I plan on marking the centre pole every 2 inches / 50mm or so. 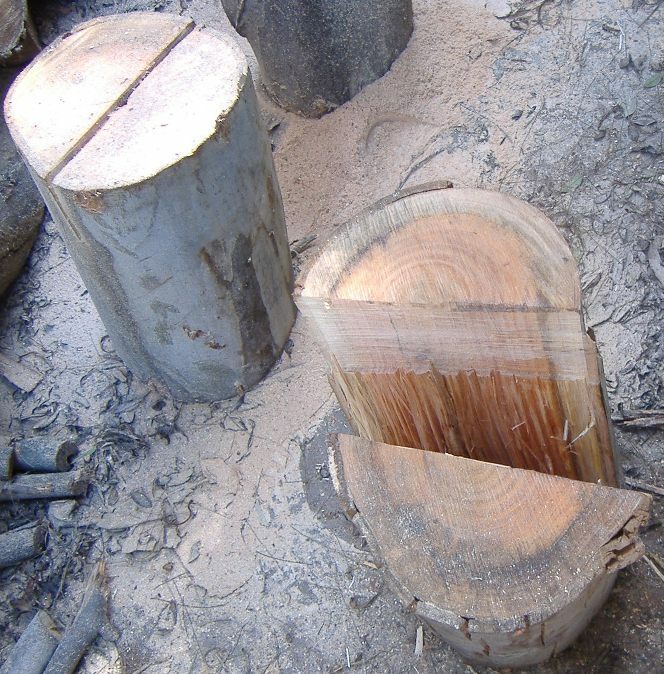 2) Split my timber and set aside 62 pieces. The 62 pieces will be 3 different timber types (probably 2 x hardwoods eg bluegum and paperbark and 1 x softwood eg conifer) of 3 different sizes (small eg 1.5kg +/- 10% ~1/4 of a 6” round, medium eg 3kg +/- 10% ~ 1/4 of 9" round and large eg 5kg +/- 10% ~ 1/4 of 12” round) each of 4 pieces. These will go in the bottom, middle and top of the HH at each point of the compass. Each piece will be moisture-meter tested, weighed, measured and recorded after splitting. 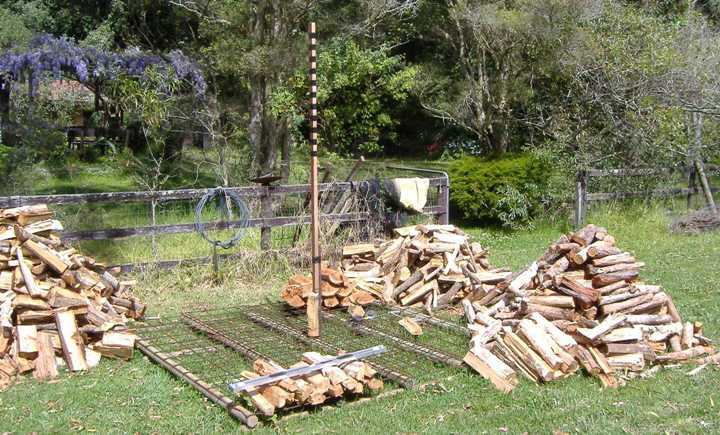 These measurements will then be used to determine how well each piece in the pile has seasoned over time, and whether pieces on the northern (sunny) side season much faster or negligibly faster, and whether height in the pile makes any difference (eg higher might get more airflow). 3 x species in S/M/L splits in middle of stack at 4 compass points = 36 pieces. 1 x species in M splits at top and bottom of stack at 4 compass points = 8 pieces. We will then be able to compare seasoning of S/M/L pieces of 3 different species in HH vs normal stacks, as well as work out if the top or bottom or sunny side of the HH seasons better, if at all. Actually I am going to add to this and place some pieces in the middle of the HH - I might take the east/west pieces for that purpose. See how I go. 3) I hope to find some scrap pieces of pvc pipe to put some additional constant measure pieces into in the HH. This will allow easy removal and re-insertion of constant measure pieces for constant measuring, and I can compare their end progress with the other 36 pieces, to gauge whether the PVC pipe surround has artificially helped or hurt their seasoning (ie extra space around the wood might help season it slightly faster. or not). 5) I will take weekly pics of the HH and post in the forum thread for “progress” along with some initial measurements. 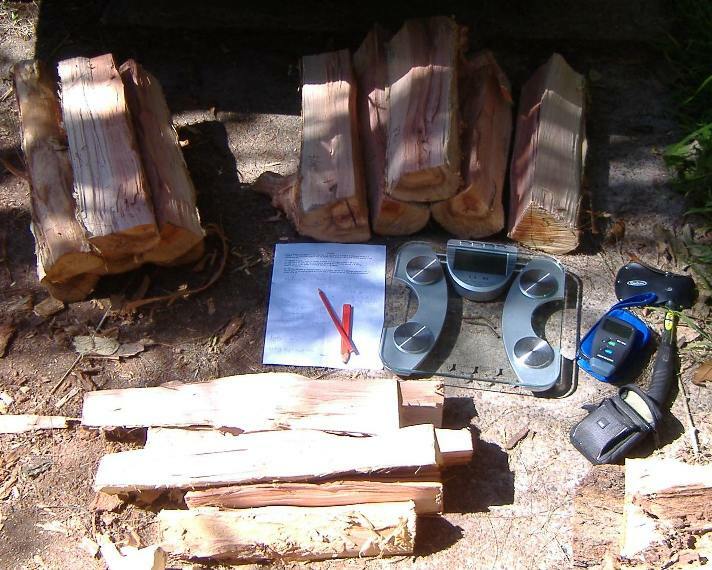 6) I plan on building 2 small rows of wood, one running east-west and the other north-south, nearby, and placing some pieces in them also measured as above, to use to compare with the HH at the end of the experiment. I haven’t seen any posts here that verify or refute the HH claim to dramatically superior seasoning, and I reckon it’s in all of our interests to resolve this. I for one am dirt curious! I originally had 4 top logs at 900mm / 3' spacing but added a log and re-spaced to 700mm / 2'4" spacing to better span the 750mm wide steel reo sheet leftovers I had. 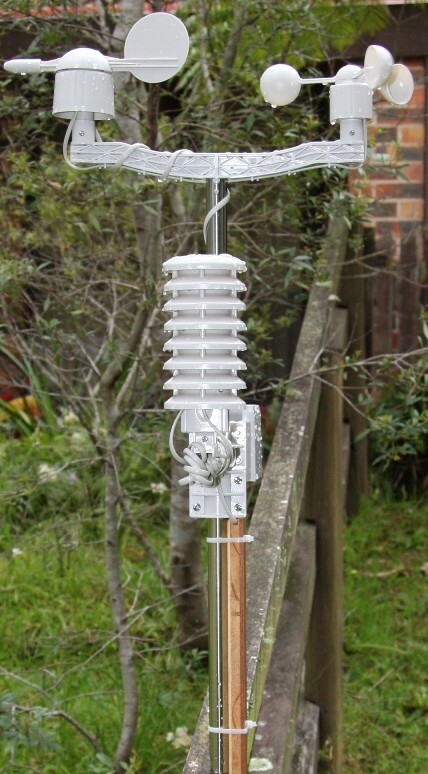 Weather Station records rainfall, humidity, temperature, barometric pressure, windspeed and direction. The weather station measurements are constantly recorded and uploaded to the weather station control panel wirelessly, which is also connected to my PC and saved into a spreadsheet for analysis. It's been raining for the last 3 days so it's on hold . . . rain is forecast for a couple more days then hopefully back into it. I had a quick week-long surf trip to Tweed Heads but am back now and doing a bit more work on the HH. I needed to split some larger and tougher bluegum rounds but my poor little electric hydraulic 7 ton splitter couldn't cope, so I started chainsawing notches in the rounds to encourage splitting. That worked to a certain extent, but with some really big rounds to split - 2 foot diameter and 2 foot long aussie hardwood - I've decided to hire a larger petrol driven splitter and work over a weekend soon. The next step was to create a marker pole which shows the height of the Holz Hausen / Holz Haufen as it seasons and settles. The idea is when it has settled 20% of the original unseasoned height it is fully seasoned. Normally you just paint the top 20% of the pole but I put marker tape every 100mm / 4 inches and marked the height so I can track the process more accurately. 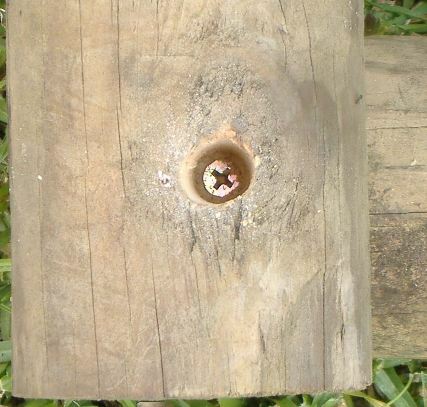 I drove a metal garden stake (star pole) into the ground and levelled it to vertical before wire tieing the marker pole tightly to the stake, resting the pole on the HH platform. This way I wont get any ground moisture up the marker pole . . . but the main reason was I didn't have a scrap piece of timber long enough to drive into the ground and still extend 2.6m / 8' 8" high :) I levelled the marker pole to vertical as well - this is not really important for a normal Holz Hausen, near enough is good enough; in fact the platform is overkill really, but I'm doing this both because I want accuracy on my experiement components for replication, because I want to re-use the platform and pole in future if the HH is superior, because having everything level will make the HH more stable and finally because I'm pedantic about this stuff!! 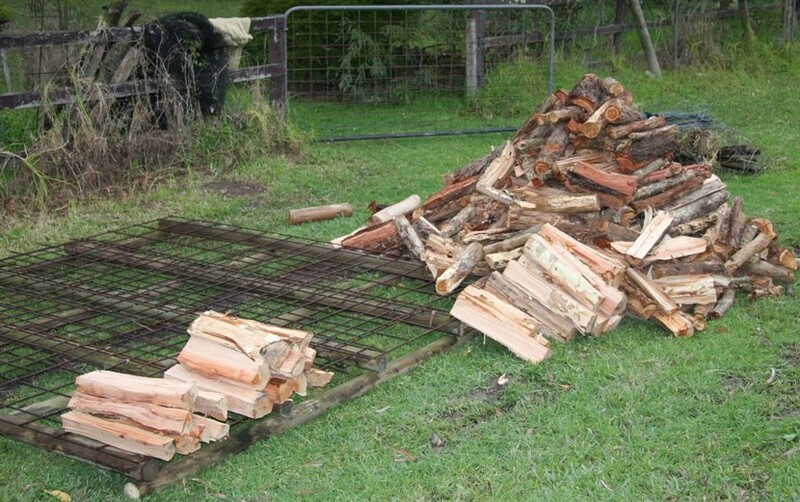 I'm now moving the rest of the wood I have lying around the place to the HH site and will commence the actual HH build after I hire the large splitter to get those large bluegum rounds split I need for the experiement. I have also bought a new set of high accuracy digital scales arriving this week - they weigh up to 7kg / 15 pounds in 1g increments :) I will re-weigh the pieces as I place them into the HH or control row.